Leaves strewn on the ground. In our home, clothes on the floor. Bare limbs sprawled like trees. No gif for that?? Lol. Another wonderful haiku. I am serious when I tell you I never had the creative skills to understand and enjoy poetry. Your words are clever with so many different meanings it is hard to keep up. This has truly expanded my ability to think, to imagine and to enjoy the art of poetry. Thank you for all your efforts. 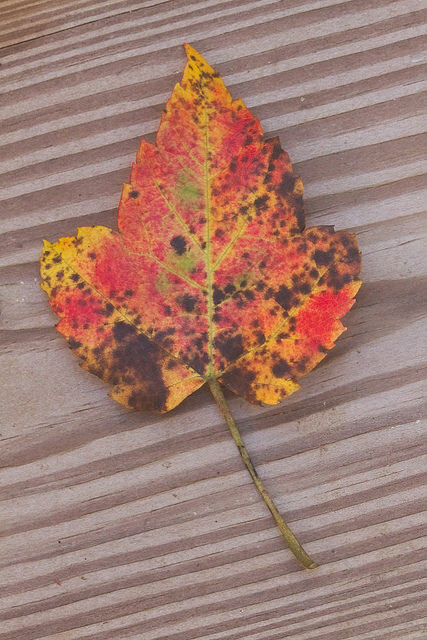 This particular leaf had unusual colors, especially up-close. There’s a hint of light green mixed with the red, but it’s not very apparent. The magnified images revealed a unexpectedly vibrant landscape. There’s a theory called, “coevolution” that states the leaf colors in the fall are linked to warning signals for insects. Very smart of the tree, because red gives off a chemical that dissuades parasites in the winter time (i.e. aphids), since the trees/plants are especially vulnerable during the cold weather. Interesting. I read about similar strange abilities: some plants supposedly emit pheromones, which can summon wasps (or bees) — and encourage them to attack perceived threats. But..I’m not sure if it’s true. Ha! Men fight over women and vice versa all the time, so I suppose it’s not such a stretch for the animal/plant world to be able to do the same.